“People need to understand that I don’t make a lot of money. For real,” Diaz told The Shoot. “I spent all my money on food. I don’t have any money. I spent it all on food. I didn’t buy anything. 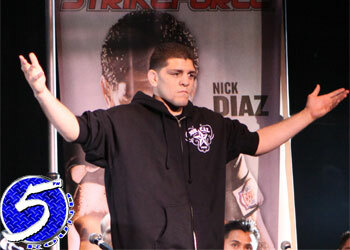 Diaz reportedly pocketed $100,000 for his win over Marius Zaromskis at “Strikeforce: Miami” earlier this year. That does not include any additional sponsorship dollars he took home for headlining the Showtime broadcast, which often overshadow MMA fight purses. Considering the median income in the United States for 2010 was only $49,777, Diaz clearly bought far too many bud brownies if his bank account is on red alert. Thankfully, Diaz’s next payday comes this Saturday and he’ll FINALLY be able to make ends meet once again. Medical Marijuana clinics across Stockton, California are anxiously awaiting his arrival.